Text messages are quick, disposable, and ready to be deleted after they’ve been read and replied to. But we don't always delete them. In the age of iMessage and WhatsApp, we're more likely to hang onto text message threads so we can see the history of our conversations. But there will always be some text messages you want to delete. In Messages, the texting app that comes pre-installed on every iPhone, iPad, and iPod touch, all of your text messages are grouped into conversations. It's easy to delete the entire conversation, but what about individual texts within the conversation? This article teaches you how to delete whole conversations and individual text messages on the iPhone and other iOS devices. Before you delete any of your texts, make sure you mean it. There's no getting texts back after you delete them. These instructions only cover Apple's Messages app on iOS 7 and up. They do not apply to third-party texting apps. Tap Messages to open it. Tap the conversation that has the messages you want to delete in it. With the conversation open, tap and hold the message you want to delete until the menu pops up. Then tap More in the pop-up menu. A circle appears next to each individual message. Tap the circle next to a message to mark that message for deletion. A checkbox appears in that box, indicating that it will be deleted. Check all the messages you want to delete. Tap the trash can icon in the bottom left corner of the screen. Tap the Delete Message button in the pop-up menu (earlier versions of the iOS may have slightly different options in the menus, but they're similar enough that it shouldn't be confusing. If you tapped Edit or More by mistake and don’t want to delete any texts, don’t tap any of the circles. Just tap Cancel to exit without deleting anything. If you were in a conversation when you last used the app, you'll return to that. In that case, tap the back arrow (or the Messages button, depending on what version of iOS you're running) in the top right corner to go to the list of conversations. If you weren't already in a conversation, you'll see the list of all your conversations. Find the conversation you want to delete. You have two options: Swipe right to left across it, or you can also tap the Edit button at the top left of the screen and then tap the circle at the left of each conversation you want to delete. If you swiped across the conversation, a Delete button appears at the right. If you used the Edit button, a Delete button appears at the bottom right corner of the screen after you select at least 1 conversation. Tap either button to delete the entire conversation. Again, the Cancel button can save you from deleting anything if you didn't mean to reveal the Delete button. If you're using iOS 10, there's an even faster method. tap the conversation to enter it. Then tap and hold a message, and then tap More in the pop-up. In the top left corner, tap Delete All. In the pop-up menu at the bottom of the screen, tap Delete Conversation. In some cases, texts that you've deleted can still be found on your phone. This may not be a big deal, but if you're trying to keep some information private it can definitely be a problem. 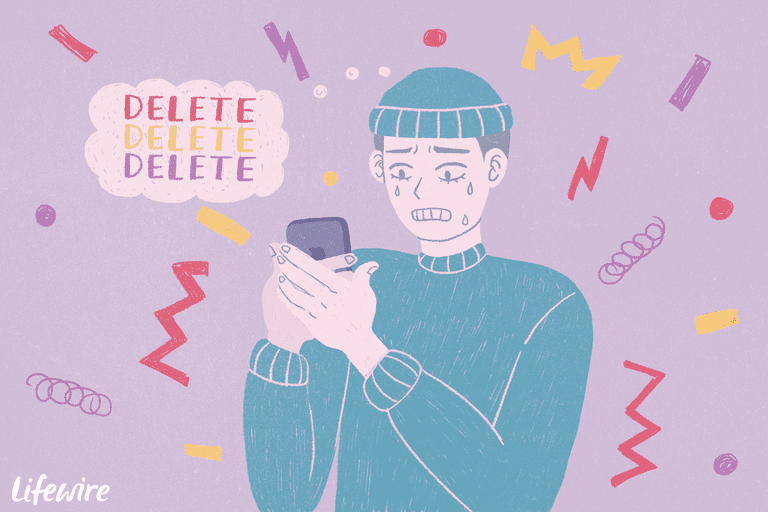 If you're encountering this problem, or want to know how to avoid it in the future, check out this article: Deleted Messages Still Showing Up? Do This. Deleted iPhone Text Messages Not Really Gone? Fix it.